It is no secret that we love pancakes in our house. They usually make an appearance at our table at least once a week. My son would eat them everyday if I would make them that often. Because we eat pancakes so often, I like to come up with different versions to enjoy. 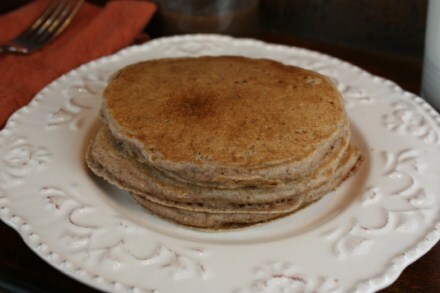 I recently came up with a gluten free cinnamon pancake that we loved. These will definitely be on the menu plan again soon. I think cinnamon pancakes would make a wonderful holiday breakfast. Mix the wet and dry ingredients together just until well blended. Cook on a hot griddle or pan. Is there a conversion for how I could make this not gluten-free? I don’t have those flours in my house and am not sure if it’s a 1:1 ratio. Help? Yes, just use 2 cups of flour in place of the sorghum flour, potato starch, and tapioca starch and it should work fine.